Real-time parking searches are a reality–in Hollywood, for now–courtesy of a San Francisco-based startup called Streetline. Imagine: you’re late for a meeting in a congested area of the city, and a bad parking situation will only make it worse. So you take out your iPhone, open up the “Parker” app, and discover that there are over four parking spaces (all of which take cash or credit) available on a street just a few blocks away from your destination. Crisis averted. Real-time parking search is something of a holy grail for drivers in big cities–and now it’s available, at least to iPhone users in Hollywood, courtesy of a San Francisco-based startup called Streetline. Streetline already works with a number of U.S. cities, such as New York and San Francisco. The company installs low-power wireless sensors in parking spots and parking meters that can give city officials comprehensive information (in map form) about available parking spots, occupied spots, and parking violations. This is useful for many reasons. A city can adjust parking rates based on when certain areas have the most people looking for spots, or it might even be able cut down on the number of parking enforcement officers since it knows exactly where to look for violations. Now Streetline is bringing some of this information to drivers with the Parker app, starting in Hollywood, one of the most car-filled neighborhoods of LA. “The app dramatically increases your chances of finding parking,” explains CEO Zia Yusuf. Drivers select an area to search in, and Parker points out where there are less than two spots, more than two spots, or more than four spots available. It also highlights pricing, hours, time limits, and whether the spots take cash or cards. The app doesn’t reveal exactly how many spaces are available on a certain street, but it does offer information on where there are the most parking spots in a given radius–which should cut down on a lot of in-car arguments. Hollywood is just the beginning for the $1.99 Parker app, which is only being revealed to Streetline’s other city partners this week. There’s no cost for cities who already use Streetline’s services to add the app, so we may soon see real-time parking information in New York City (sensors are installed on Roosevelt Island), San Francisco (in the Embarcadero), and elsewhere. 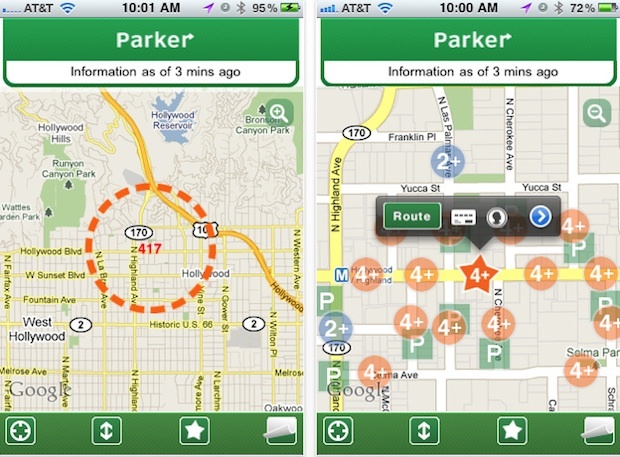 Streetline also hopes to add Parker to in-car GPS systems. An Android app will be available in the beginning of 2011. “This is the beginning of changing how people park,” says Yusuf.